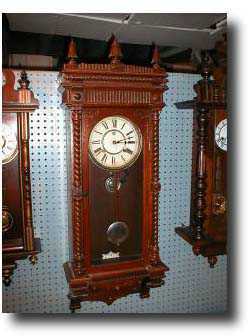 American regulator wall clock; Waterbury Clock Co. "PERTH" model, c.1890 Solid walnut case, eight-day, spring wound movement., recently cleaned and adjusted. 41 1/2" tall by 16" wide; Condition: Fine. Additional Dealer Comments: This eight-day regulator clock retains its original dial and features a cathedral strike-gong on the hour and half-hour. The original Waterbury logo on the dial and a beautiful nickle pendulum combine to make this a really attractive clock. All of the original finials and case ornamentation are intact. The walnut case has been professionally refinished. Note: The rear of the case includes two labels...one listing this as the "PERTH" and the other listing it as the "LEEDS". Evidently, at the Waterbury clock factory the employee whose job it was to apply the trade name labels to the clocks as they came from the assembly department was daydreaming when this clock came to his work bench. Consequently, he applied both labels....the PERTH and the LEEDS. It is, in reality-the 'PERTH'.